Angelica is a magical botanical in gin, one that is relatively underappreciated despite its frequency. On its own, angelica root has a complex bittersweet, woody, and herbaceous aroma along with a slight,, but distinctive note of musk. It’s this final quality that comes to define angelica the aroma and angelica the botanical. Although it only makes up <1% of root’s essential oil composition by volume, a musky lactone called pentadecanolide gives angelica its unique character and ties the root back to the perfume industry. Though other parts are sometimes used, including the seeds— the root is the primary source of angelica in gin. Sweet and woody up front, Lockhouse Distillery’s Angelica Dry Gin becomes more traditional mid-palate with plenty of juniper to complement the signature botanical. The nose is sweetly pine-forward with a creamy, bittersweet aroma. Angelica is the predominant note here— true to its name. But more than just a one-note bomb, there’s sweet herbal notes like mallow root, a hint of fennel, and a camphor glow. The signature botanical is on display in the palate. Early, there’s an earthy sweetness— if you haven’t had the pleasure of tasting a nearly pure angelica spirit— it’s not quite that, but it’s close. That bittersweet earthiness becomes camphor mid-palate; towards the finish there’s pine, juniper, and birch bark. The finish is quite long and gently birch and angelica— think more the flavor of the bark rather than an aged spirit. Though there’s these woody notes, there’s no trace of tannin, vanillin or any other wood influence. 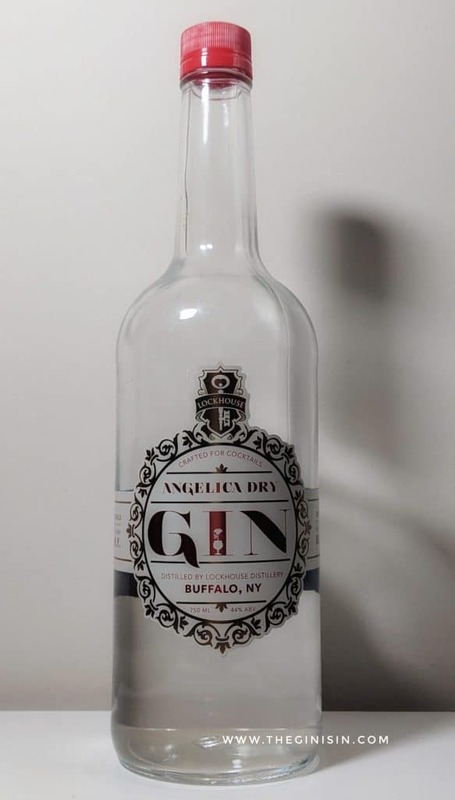 Angelica Dry Gin was specifically designed for cocktails. I did not have the proper ingredients to cast either the Teenage Dream or Eastern Promises— two cocktails which were featured on the Angelica Tea Room’s Fall Menu. But I was able to mix with it at home. Although some of the bittersweet woody notes made for an unusual Gin and Tonic, the one place that I was blown away was how perfect it was in a Martini. Especially dry, gently stirred, Angelica Dry Gin has a beautiful, almost quintessential Martini profile. I highly recommended it if you ever stop by the Angelica Tea Room, which unfortunately is the only place you can get this otherwise quite excellent signature botanical gin. If this gin was more widely available, I’d easily recommend it to fans of classic style gins— the angelica and other botanicals read as classic, if a hint more musky than your expected London Dry style gin. So overall, if you’re in Buffalo— swing by the Angelica Tea Room and try some of their cocktails that feature their signature house gin. It’s worth the trip for the gin alone. This gin is exciting, and unlike anything else available on the market— gin nerds should be lining up. *Full Disclosure, I’m a regular contributor— along with several other great writers.